This was a slight "My Roommate Isn't Around To Think I'm Weird" kind of craft project. I just wanted to make something to diffuse the light a little so that I can sleep better. Oh, and I wanted a fort. As I am not at home, I didn't have all the necessary craft supplies (fishing line would have been perfect, and wood glue probably would have also been helpful) so it is currently held together by duct tape, which is mostly hidden, and blue yarn, which is not so hidden. There's a second phase to the project which involves painted wooden stars hanging from the canopy, but I haven't gotten that far yet, and I may not because I think I like it like it is. "button, button...who's got the button?!" i think everyone should have a fort. this is excellent! That rocks! 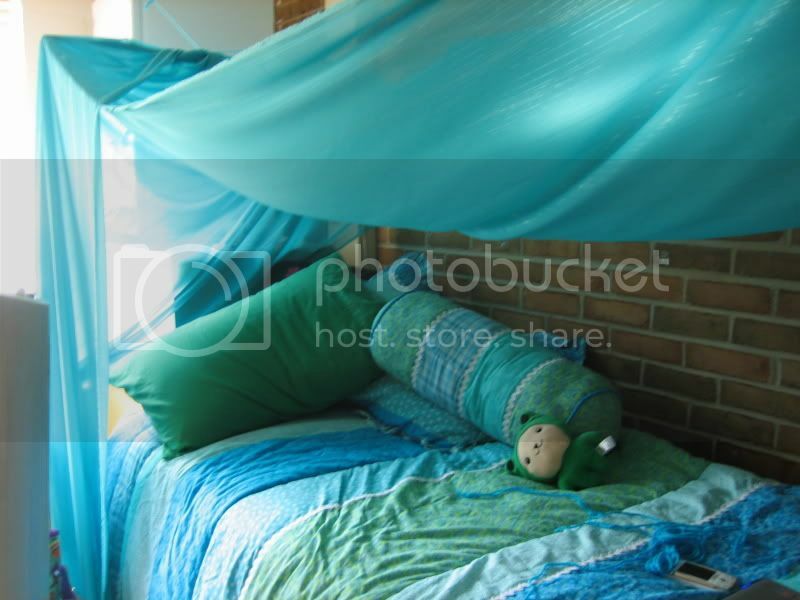 I've always wanted to make my bed into a fort too. Love the colors! How fun! I also love your bedding! Awesome! I was telling my friend how much I want to turn my bed into a fort. After seeing how nice yours is, I might just have to do it too! Oh! How'd you do that? Details! That's really cool! Love the color scheme! I also want to know how! I love the color scheme and how it creates a personal space. Very beautiful and mystical! This is quite easily the easiest thing I have ever done. Basically, all dorm beds have holes in the posts in case you and your roommate want to bunk your beds. All you have to do is go out an buy dowel rods that fit in them. Then I taped another dowel rod to the two in the holes (which is where woodglue or somehting would have been helpful). Then I took the fabric and stretched it across. The dowel rods bend under the weight, so I secured them (think like a suspension bridge) to my desk on one side and my fridge on the other. To keep the fabric from sinking too low, I tied a string to one of the dowel rods and took a sewing needle and put it through the fabric and tied it to the other side. Basically, I had no plan beyond the dowel rods, so everything afterwards is sort of incidental. I plan on making it prettier when I get fishing line, but for now it's good. Wow, I had one almost just like that in MY dorm room! 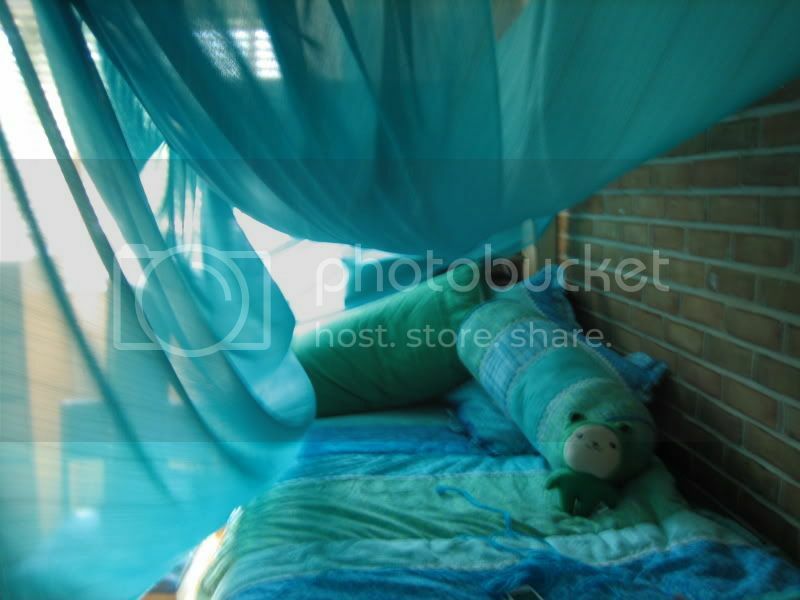 Mine had a wood frame that was held up by my bed, and the fabric was double sided sticky taped to the walls. It was made out of indian tapestries. I've tried to recreate it everywhere I've lived since, but it never feels quite the same. You really CAN do anything with duct-tape! i love the brick wall, my dorm was sooooooooooo ugly... puke colored standard issue school cinder block walls gross! "I've got drinks piling up on my desk and a stack of pills I haven't even opened yet!" "We're not gonna hide who we are, ok? I mean, we date, we're straight, get used to it." From the fort idea to the colours. This is so romantic looking. I love it! Awesome. I did a similar thing in my dorm room in college too, using spare bunk bed parts for the frame. My roommate didn't find it weird, because she had a fort too ? she made a smaller version in the raised space beneath my bed! We had two caves and it was great.